We hope you adore our delicious Clean Supper Club recipes, from sweet treats to easily prepared suppers. Our food swops are straight forward and ready to be included into your daily eating. Whatever your foodie preferences are vegan, vegetarian, pescatarian, dairy or gluten free we have recipes to suit everyone. But first and foremost we hope, like us, you will see and feel the health benefits of eating Clean Supper Club. We’d love you to eat like this every day and you might well do just that. In which case you will feel invincible! 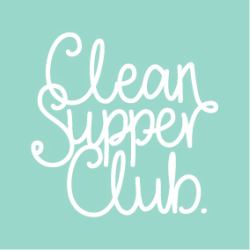 We know that any of the Clean Supper Club recipes you choose will help you feel better inside and out. Once you start you will soon find more recipes sneak into your daily routines and soon it will all be an easy habit and you’ll wonder why you were hesitant at all! One of our main goals is to help you find a realistic and balanced way of enjoying food. We know that there will be dinners with friends, work obligations, holidays, birthdays, parties and weddings don’t worry about them, enjoy! We will guide you through them and help you make the right food choices to keep you looking and feeling great - embrace food with out guilt. Clean Supper Club allows you to occasionally say ‘sod it, I’m having a large slice of cake’ & when you are all embracing that blustery, cold walk along stunning coastline you can relish fish and chips out of paper. We eat Clean Supper Club slightly differently. Sarah has no food intolerances and at certain times you will find her reaching for the occasional coffee, (not any old coffee it has to be proper Italian Coffee). Claire has never got on with caffeine it’s always made her sick but is quietly addicted to salt & vinegar crisps and so far we haven’t heard of any one who has been able to make them clean! Sarah eats Clean Supper Club 80 % of the time, Claire more so (90+%) because of reactions to certain foods. Eating our Clean Supper Club recipes this way has released us from a lot of digestive issues. We’ve both found a way that suits us and our aim is to help you find your way to eat Clean Supper Club too. It’s liberating to no longer suffer acid indigestion, bloating, and strange hot flushes and not to feel sluggish (the list goes on!). We want you to embrace a life with glowing skin, shiny hair and full of energy. We are not perfect; we do not have 6-pack abs that we will be sharing with you on social media because we have womanly curves and stretch marks of which we are very proud! Both of us love exercise and fresh air; this helps our minds and bodies no end. Between us we enjoy yoga, Pilates, running, strength training, Kettlercise, Zumba and a spot of hula hooping but we don’t get to do this every day. We aim for a minimum of 3 times a week and pat ourselves on the back if we manage more. For daily food inspiration read our blog or follow us on any of our social media links.